Winter is the only season when I crave soups. And sweet-sour-spicy Asian soups are my favorite. Their tempting aroma and slowly building heat are warming to all the senses. Before I went down with the flu I tried to fight its lurking shadow with a Thai inspired soup loaded with ginger, garlic and chili. It obviously didn’t do the job, as I’m writing this from my sick bed, but it postponed it enough for me to go out to see a movie. It’s actually a mix of Thai Tom Khaa Kai and Vietnamese Pho recipes with a Japanese guest appearance – udon noodles. The base is coconut milk, chicken broth, fresh ginger, fish sauce and chili. The rest of the ingredients could vary. I added garlic this time for extra flu resistance and mushrooms, as I was out of shrimp and somebody devoured the leftover roast chicken breast. The noodles are not necessary, but we all love the thick, slippery udon and the way you can slurp them in good conscience. The soup makes a light lunch or supper. If serving the soup to kids skip the fresh chili and let everybody add chili-garlic sauce individually. Don’t be afraid of the long list of ingredients – the soup itself is ready in few minutes. Heat a deep sauce pan or wok on medium high, add the first six ingredients and bring to a boil. Don’t worry if the milk splits – it’s normal. If using chicken, add it now together with the fish sauce and sugar and simmer for 5 minutes until cooked through. Add the rest of the ingredients and simmer for 2-3 minutes – the shrimps cook really fast and the tomatoes shouldn’t lose their shape. Check for seasoning and adjust. The soup shouldn’t be too spicy, but rather a balance of sweet, sour and spicy. Add the spring onions and herbs. Serve over cooked noodles (if using) with extra lime slices, fish sauce and chili-garlic sauce to perk it up. Recommended even if you are not about to drop sick any time soon. This entry was posted on Tuesday, February 24th, 2009 at 8:40 am	and is filed under Recipes, Soup. You can follow any responses to this entry through the RSS 2.0 feed. You can leave a response, or trackback from your own site. Wow. 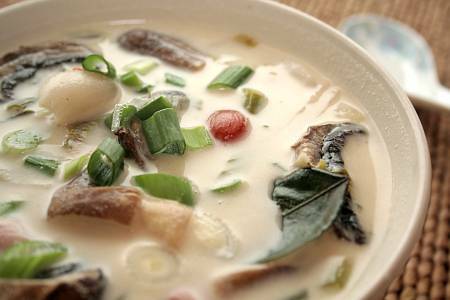 Tom Kha Gai Udon. This is brilliant. Growing up I’ve had my share of Tom Yum noodles which is very similar to this, except with clear broth instead of coconut milk. This looks very decadent and delicious. Coconut milk-based broth and slippery Udon = yum. I could be running a fever when I was making it, but I must admit it is a great combination:) Thanks for the nice words! I love soups too,mainly in winter. This soup looks delicious Love it.